MATLAB has an extensive API (Application Program Interface) for building and modifying Simulink models from MATLAB code. This may be from either the MATLAB command line, from within a function or script, or from anywhere that m-code can be executed. 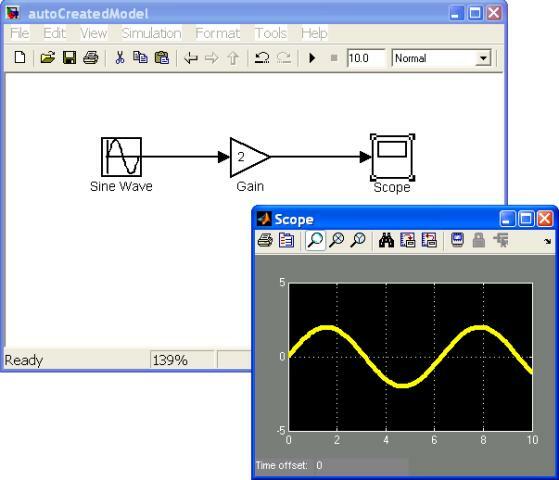 This tutorial discusses several of the more common functions used to build and/or manipulate a Simulink model using m-code. The primary functions for this are get_param and set_param. They enable every property of a model or block to be inspected and changed respectively from MATLAB code. Note that there are many hundreds of parameters, and for most the default settings are sufficient. Building a Model Using M-Code. get_param is the primary MATLAB function for inspecting the existing properties of a model. Before using get_param the model must first be loaded into memory. This can be achieved by either opening the model manually (see Opening a New or Existing Model) or by using either of the the API functions load_system or open_system. This tutorial uses the simpleModel developed in the tutorial Simulink Essentials - Building, Simulating and Visualizing Models, and assumes that it is has been opened. Assuming the name of a particular parameter of interest is known then get_param can be used to inspect the specific parameter of interest. Figure 1 give some examples of using get_param. Note that some parameters do not effect the actual simulation (e.g. Name and Location) while other do (e.g. Solver and StopTime). Figure 1: Examples of Using get_param to Inspect a Specific Parameter. There is also an optional input to get_param that will return a structure array containing a list all parameters and their current values. This is shown in Figure 2. Note that (as of R2010a of MATLAB) a Simulink model has 569 parameters, hence they are not all shown. Figure 2: Examples of Using get_param to Inspect All Parameters. Although not explicitly shown here, get_param is also used to inspect the parameters of blocks within a model. All blocks have a set of common parameters with each type of block having additional parameters that are specific to that block type. The analogous function to get_param for modifying model and block parameters is called set_param. It requires three inputs: the name of the object (block, model or signal) to modify; the property to modify; and the new value. Note that some properties are read-only and hence cannot be modified. Some examples of using set_param are given in Figure 3. ??? block_diagram parameter 'SimulationTime' is read-only. Figure 3: Examples of Using set_param. It is possible to build a Simulink model using purely MATLAB code -- without using the usual visual, point and click, mouse operations. Although rarely done, it does show how to use various of the MATLAB-Simulink API functions. The API functions are particularly useful for developing custom blocks with functionality that include the ability to automatically modify themselves or the model in which they reside. This may be required for instance if a particular block parameter is used to configure how a block behaves during simulation. Figure 4 gives an example of a MATLAB function that will automatically create a model. The code first checks to see if a model with the specified name already exists and if it does then it deletes it. A new model is then created using the API function new_system; the model is constructed using the API functions add_block and add_line; some model properties are modified (from their default values) using set_param; and finally the model is saved using save_system. All of the above occurs without the model becoming visible to the user. Figure 4: Different Syntaxes for the sim Function. Executing the code given in Figure 4 creates a model called autoCreatedModel. It is shown in Figure 5 along with the output when the model is simulated. Figure 5: The Automatically Created Model. This tutorial has discussed topics related to using the MATLAB-Simulink API. Other Simulink tutorials are available on the Software Tutorials page.